This article is written by Paddy Hastie, Winter Equipment Manager at Peacock Salt and a member of the National Winter Service Research Group‘s (NWSRG) Technical Advisory Group. Peacock Salt recently undertook a study to compare the salt saving recovered by a number of UK Gritting Contractors when they switched from a leading brand salt spreader, to the Hilltip IceStriker 850. 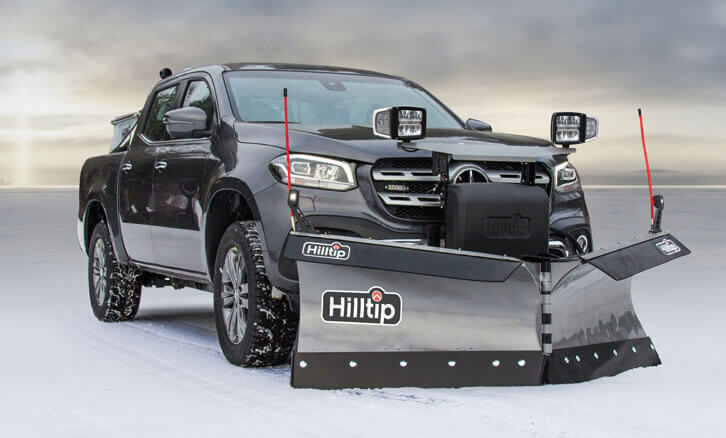 The Hilltip IceStriker 850 uses GPS technology to allow the driver to apply salt using a g/m2 control. The system ensures the amount of salt is consistent with that target regardless of changes in the vehicle speed.The effect is a higher control over salt distribution and protection against over-salting. The leading brand spreader’s technology is commonplace, with an auger and spinner control. Users can follow a calibration method at each site with the aim of putting down an appropriate amount of salt. Often this can lead to covering the ground in salt without adhering to any particular guidelines. There can be salt wasted and a high cost incurred, as a result. Peacock Salt compared data over two winter seasons, one year with the leading brand spreader and one season with the Hilltip IceStriker 850. The comparison used the same region of the country and winters with similar weather pattern. It also accounted for the number of site visits and worked out a weight per site visit. Both spreaders held a similar weight of salt. It was found that sites using the Hilltip IceStriker 850 used 33% less salt. Customer satisfaction remained consistent over the period. No detrimental effect was noted on claims from slips, trips and falls. These spreaders also used Hilltip HTrack which helped one Contractor to more than halve the time taken to resolve any claims which did arise. 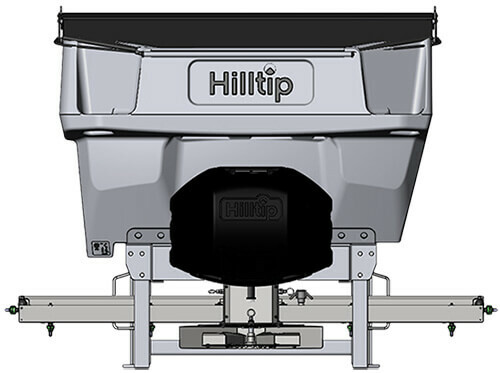 HillTip has launched three new spreader models for the coming winter season. The extended range now covers more vehicles and machines of different weight classes. HillTip’s production facility in Pietarsaari on the west coast of Finland manufactures snow plows, sweepers, salt and sand spreaders . The products are distributed across Europe via a wide network of dealers. 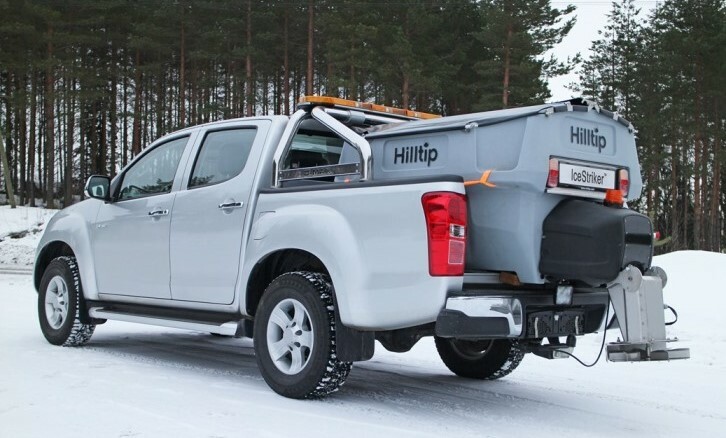 HillTip is the leading supplier of snow clearing equipment for pick-ups and light commercial vehicles weighing up to 7.5-tons. 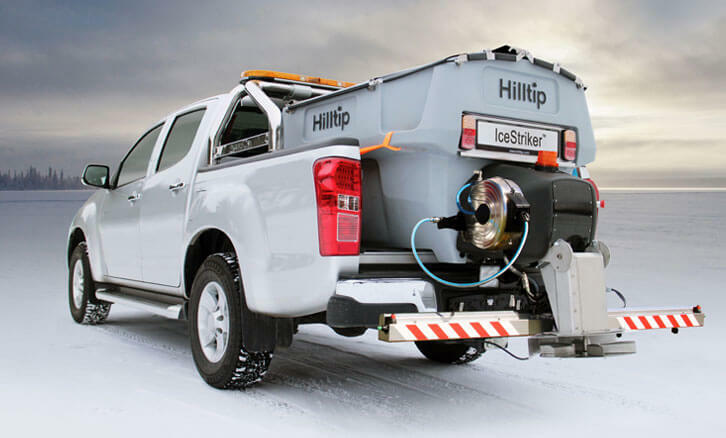 The smallest spreader from HillTip’s new range is the IceStriker™ Tailgate 120-200. 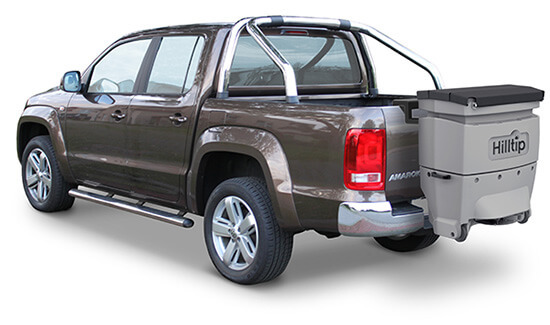 The tailgate spreader is available in two different sizes with capacities of 120 and 200 litres, and thanks to different mountings, it can be mounted on pick-ups, UTVs, forklifts, loaders, compact tractors etc. The spreader’s polyethylene hopper and stainless-steel metal parts give optimal protection against rust and corrosion, as well as saving weight. HillTip is continuously on the edge of new technology and invests in developing modern and practical solutions for our customer’s, says Frank Mäenpää, Sales Manager & Co-founder at HillTip. What sets this spreader apart of other salt spreaders offered on market today is the unique smartphone app, ”StrikeSmart™”, which acts as a control system. 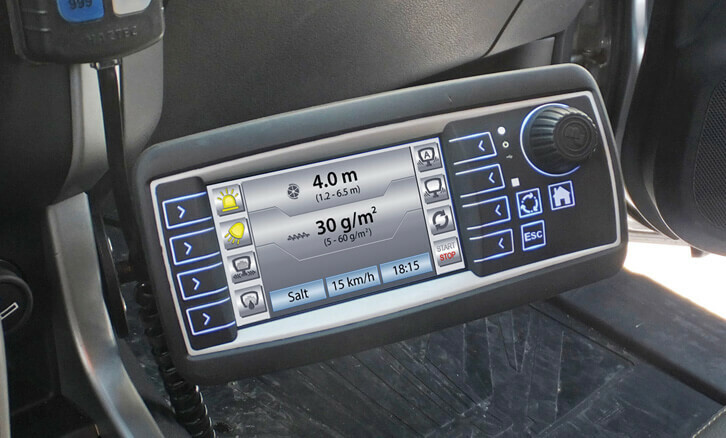 The driver controls the spreader using the supplied smartphone, which communicates with the spreader via Bluetooth. 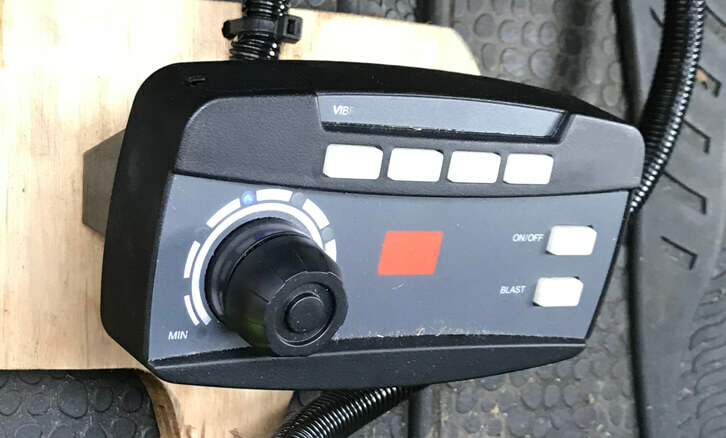 The control system is managing GPS speed control that maintains the spreading volume (g/m2) regardless of vehicle speed as a standard feature. A new use for smartphones has launched, controlling sand & salt spreaders. Another new addition to the spreader range is the IceStriker™ 1600, 2100 and 2600, introduced for trucks and vehicles weighing between 3.5-10 tons. The spreader is the largest electric combi polyethylene spreader on the market. The electric spreader with a 12/24V control system holds up to 2600 litres of salt or sand. The salt spreader is having all of the popular features of the well-known, smaller IceStriker™ models. The polyethylene hopper spreader is double walled and forms an integrated tank that can hold up to 900 litres of brine solution that can be used with one of the optional liquid de-icing systems. Using brine solution is an environmentally-friendly and cost saving de-icing method to traditional salt spreading. The new Icestriker™ salt and sand spreader can be supplemented with a pre-wet system with brine solution or used with a spray bar as just a brine solution sprayer. HillTip has also made it possible for the customer to choose whether the feed system should operate via auger or conveyor, We want to adapt the spreader conveyor system according to the customers conditions. The third spreader launched this year is the IceStriker™ 600-800 TR, HillTip’s popular flagship spreader model, now available for tractors and loaders by demand from our clients, says Mäenpää. The spreader is available in two sizes. It has a material capacity of 630 and 850 litres, and can hold up to 330 litres of salt liquid. The components are made of stainless steel and the double walled hopper is made of HD polyethylene and can be filled with brine solution if the spreader is equipped with a liquid de-icing system. The pre-wet system wets the salt or sand which increases the melting capacity considerably and, using the spray bar, can convert the unit to a complete salt liquid spraying unit. 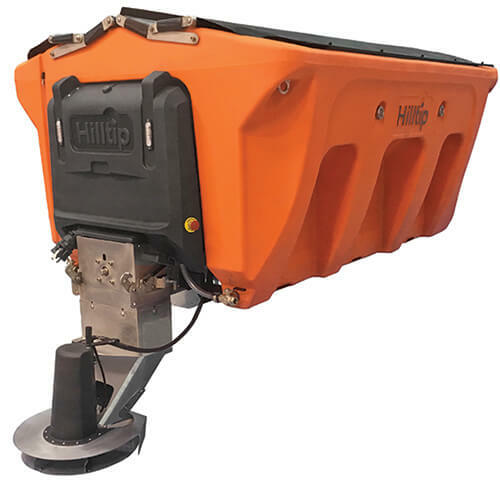 All HillTip spreaders come equipped with GPS speed control as standard, which means that the flow is adjusted automatically to maintain the spreading volume (g/m2) regardless of the vehicle speed. This system provides large savings on material costs and has less environmental impact. In addition to automatic speed control, there is a manual mode where a fixed spreading value can be entered. 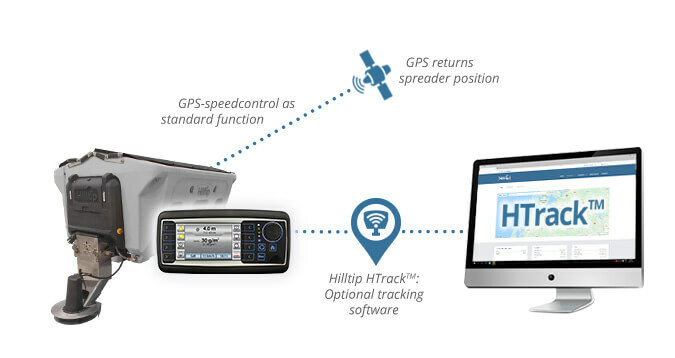 Last year, HillTip launched the HTrack™ tracking software, which can be purchased as option, as a one-time license fee. It’s compatible with all HillTip spreaders and snowploughs. 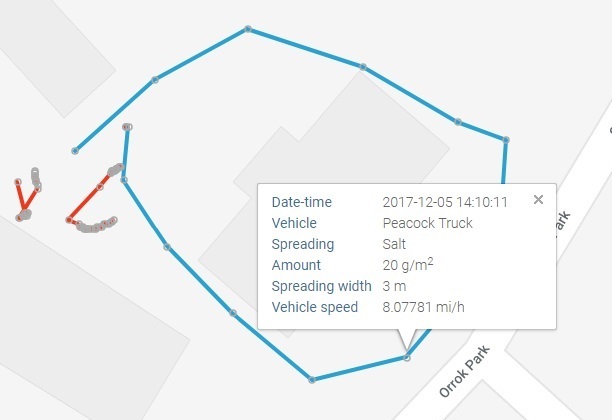 You can track and manage all units online via a computer, tablet or mobile phone thanks to GPS and 3G modem integrated into the spreader controls. The software shows the spreading route on the map, as well as the speed, GPS position, material being used etc. HTrack helps the user to keep better track of material costs, and also provides printable spreading reports that can be used for billing and as proof for insurance issues regarding slip and fall accidents.